MONTRÉAL, QUÉBEC--(Marketwired - March 1, 2018) - Matamec Explorations Inc. ("Matamec" or the "Company") (TSX VENTURE:MAT) and - Canada Strategic Metals Inc. ("Canada Strategic Metals" or "CSM") (TSX VENTURE:CJC)(FRANKFURT:YXEN)(OTCBB:CJCFF) are pleased to announce the addition of a second diamond drill at the Sakami Gold site to increase the current drill campaign to 8,000 meters from the previously announced 5,000 meters, as per a press release issued on February 8, 2018. The second drill will focus on the shallow horizon mineralization of Zone 25 in the La Pointe area. On-site current productivity is going well at Sakami, with 4 deep horizon holes already completed. 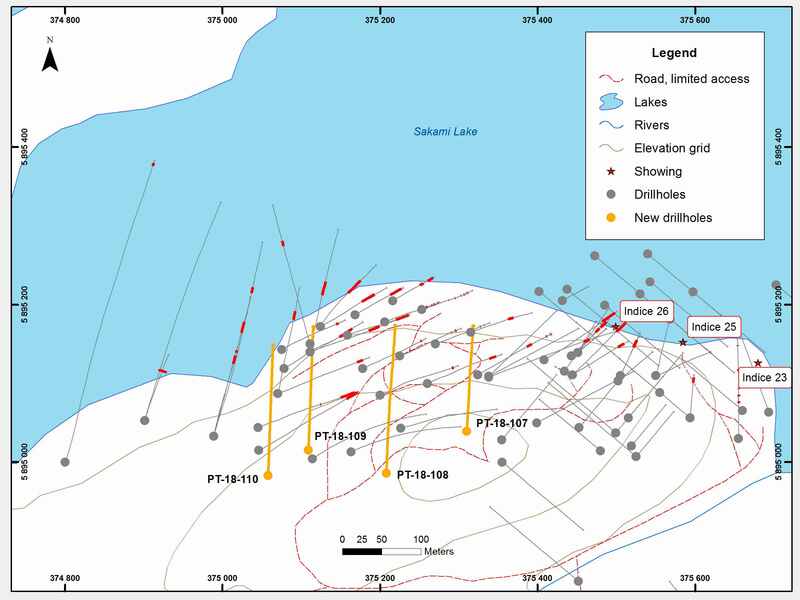 Matamec Explorations Inc. jointly owns with Canada Strategic Metals over 100km of continuous land on the volcano-sedimentary contact of the Eastmain and La Grande volcanic belts in James Bay, Quebec. All the properties located along this corridor are served by an existing infrastructure network, including roads, power lines and airports. The geological settings of this sub-province are host to several new discoveries and deposits such as Cheechoo, Eau Claire, Coulon, La Grande Sud, Eleonore and the Sakami Gold project. Jean-Sebastien Lavallée (OGQ #773), geologist, shareholder, Executive Chairman and Exploration Manager of Canada Strategic Metals and a Qualified Person under NI 43-101, has reviewed and approved the technical content of this release. Located in Montreal (Québec), Matamec Explorations Inc. is a junior mining exploration company in which primary activities are oriented on the development of gold assets. Matamec's main focus is on the SAKAMI gold property (50%), in proximity to the Éléonore Mine (in James Bay, QC); Opinaca Gold West (100%), located in the Quebec Plan Nord region in similar geological settings as established gold-producing mines; and the Casa-Detour property (100%), located east of the Burntbush property of Detour Gold Corp.
Matamec has two other gold properties in Ontario, Matheson JV (50%) and Pelangio (100%) located near the Hoyle Pond Mine in Timmins. Matamec's other mining properties include key elements for technologies related to energy containing, among others, lithium (Tansim-under option), Cobalt (Fabre-100% owned), nickel (Vulcain-100% owned) and rare earths (Kipawa-72% owned by Matamec). The Kipawa Heavy Rare Earth Elements (HREE) project is a joint venture owned at 72% by Matamec and 28% by Ressources Québec (acting as agent of the Government of Québec). Toyota Tsusho Corp. of Nagoya, Japan holds a 10% royalty on net profit from the deposit.